French Guiana is a beautiful overseas département of France located on the northern coast of South America, nestled between Suriname to the West and Brazil to the East. This part of South America has a highly dynamic coastal system. The coastline is influenced by the Amazon River via a multi-year cycle of sediments migrating along the coast from East to West. Mudflats accumulate as currents bring sediment from the Amazon River to a shifting series of locations along the coast of Brazil, French Guiana, Suriname, and Guyana (the latter three often referred to as the Guianas). Next, the rapid colonization of mangroves leads to the establishment of mangrove forests. And then, significant erosion begins again as currents shift away from a particular location, causing the die off-of the mangrove forest, and the erosion of land that can extend inland multiple kilometers. At any one time many large mudflats exist along the coast, each one containing a year’s volume of mud from the Amazon River and can be up to 5 meters thick1! 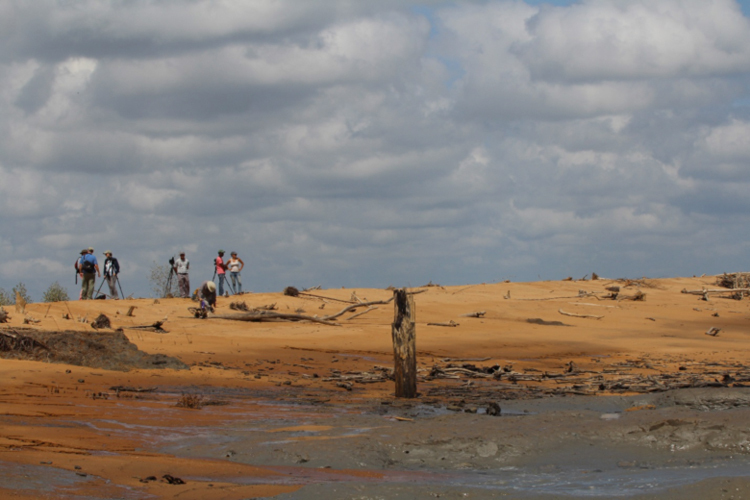 Mud from the Amazon River is deposited on the beaches and accumulates rapidly in French Guiana. 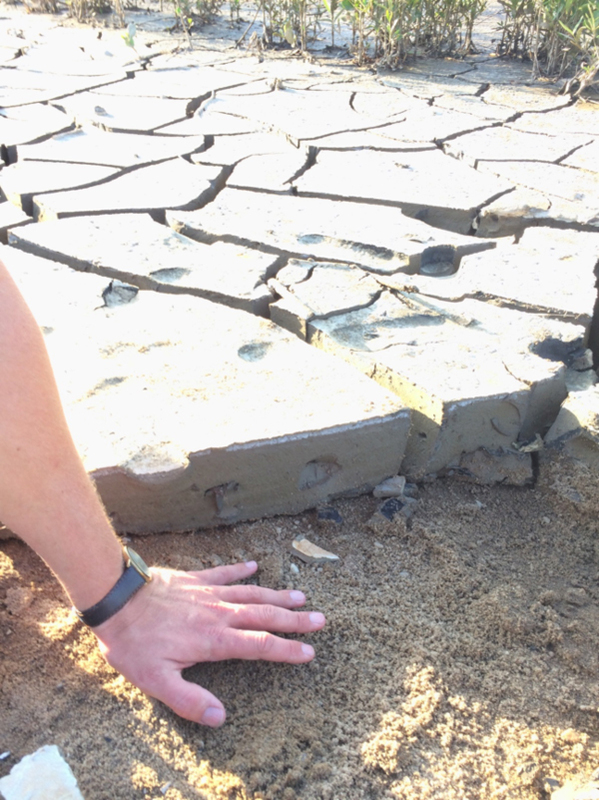 This mudflat developed in just a couple of years. A flock of semipalmated sandpipers cruise across the sediment-rich waters on the coast of French Guiana. 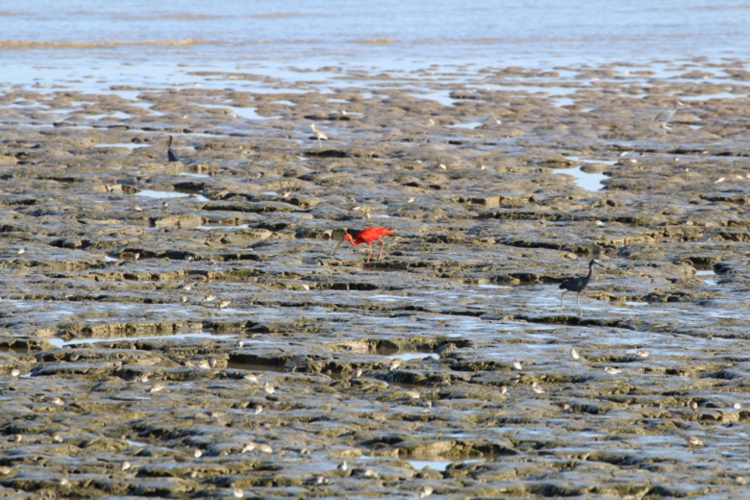 At low tide, the exposed mudflats near the Amana Nature Reserve are used by a variety of waterbirds including Semipalmated Sandpipers, Willets, Little Blue Herons, and the conspicuous Scarlet Ibis. This ever-changing coastline provides important habitat for a variety of shorebird species including but not limited to Whimbrel, Greater and Lesser Yellowlegs, Short-billed Dowitcher, Red Knot, Sanderling, and Semipalmated Sandpiper. 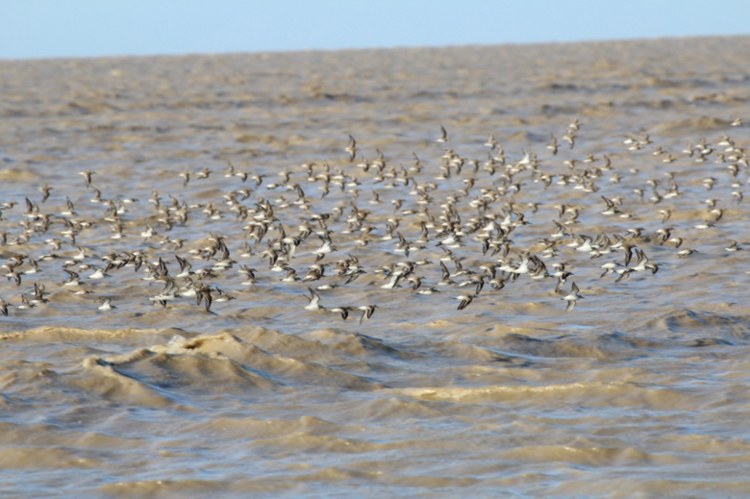 Aerial surveys in the 1980s led by the Canadian Wildlife Service shed major light on the importance of the north coast of South America to shorebirds. Of all the small shorebirds recorded around the coast of South America, 84% were found in the Guianas, plus 42% of all medium-sized shorebirds. While Suriname was found to be particularly important, 19% of all the small shorebirds surveyed, mostly Semipalmated Sandpipers, were seen in French Guiana2. Confirming observations of Semipalmated Sandpiper population declines elsewhere in the Atlantic Flyway, surveys conducted in the 2000s found less than one third (30.6%) of the number of birds observed in the 1980s3. 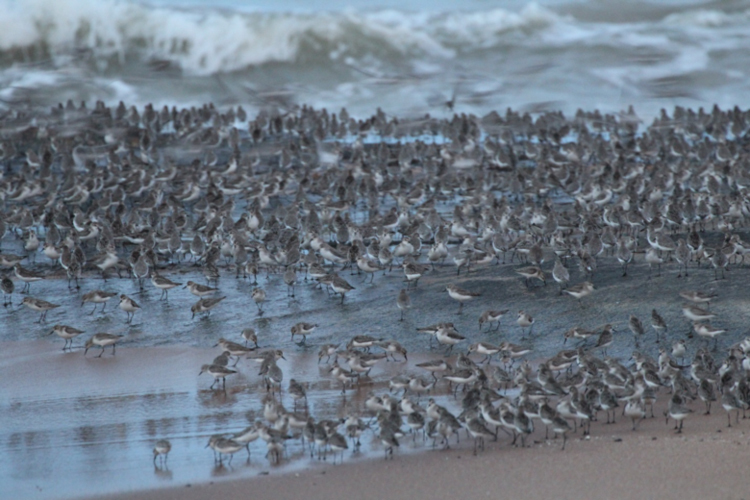 In early October 2016, Manomet’s Rob Clay (WHSRN Executive Office) and Monica Iglecia (Shorebird Habitat Management Division) were invited to a management workshop to address the “Conservation and Management of the West Atlantic Flyway’s Shorebirds”. The workshop was hosted by the Group for the Study and Protection of the Birds of French Guiana (Groupe d’Etude et de Protection des Oiseaux en Guyane, GEPOG) and the goals were to discuss opportunities for habitat management and conservation in northern South America and the Lesser Antilles. The workshop was attended by representatives of Manomet, U.S. Fish and Wildlife Service, Environment and Climate Change Canada, New Jersey Audubon Society, University of La Rochelle, Nature Reserves of France, Amazona (Guadeloupe), Coastal Protection Agency (Conservatoire du Littoral), The National Hunting and Wildlife Agency (Office National de la Chasse et de la Faune Sauvage- La Délégation Inter-Régionale Outre-mer), and Tulane University. During our time in the region, we visited the Amana Nature Reserve and the nearby Mana rice fields. The Mana rice fields are located near the town of Mana in western French Guiana. The fields include both cultivated land and areas that are no longer farmable due to the dynamics of the coastal system. Over the last decade, nearly 2 km of coastline have eroded, taking with it a large section of the northern part of the rice fields- flooding them with ocean water and rendering them no longer suitable for farming. A flock of shorebirds, mostly Semipalmated Sandpipers, rises up above the young mangrove forest. 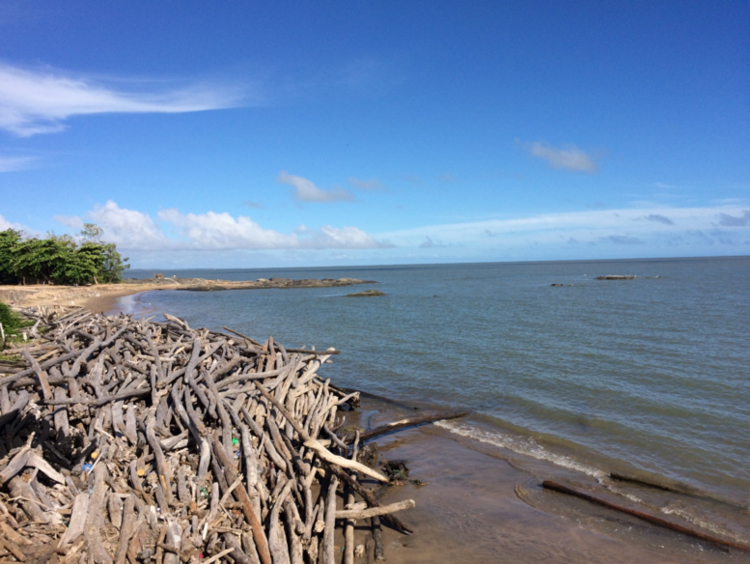 A pile of dead mangrove trees in the capital city of Cayenne, French Guiana. Forum attendants at the Amana Nature Preserve in French Guiana. 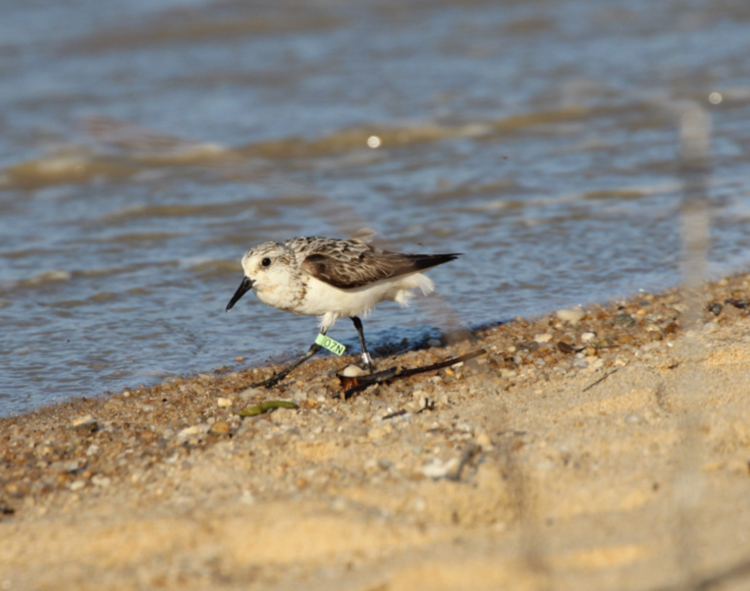 A Sanderling with a light green flag was one of the first shorebirds seen on field excursions in coastal French Guiana. This bird was flagged on the East Coast of the United States, underscoring the linkages between North and South American and the need to work collaboratively to conserve highly mobile species. 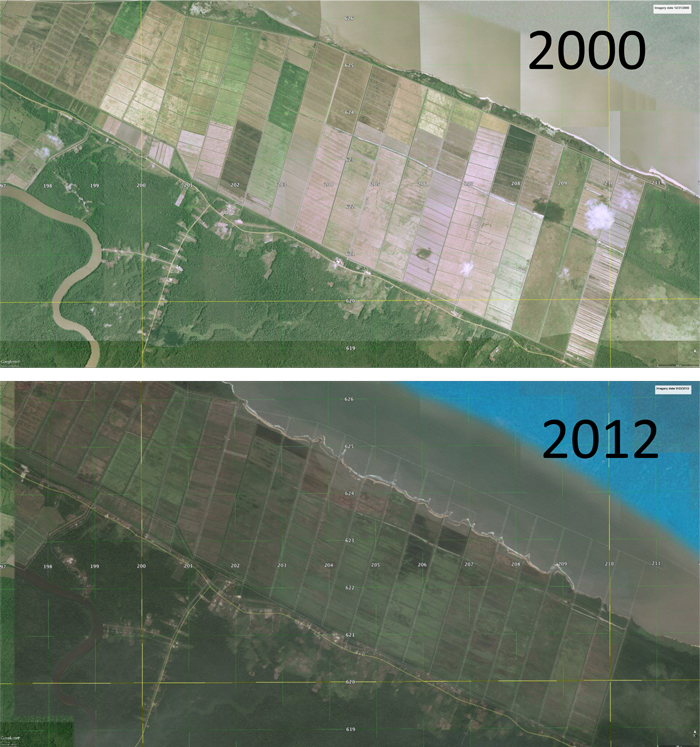 The Mana rice fields in 2000 and 2012. Despite the loss of arable land, this area continues to provide habitat for shorebirds and other waterbirds. 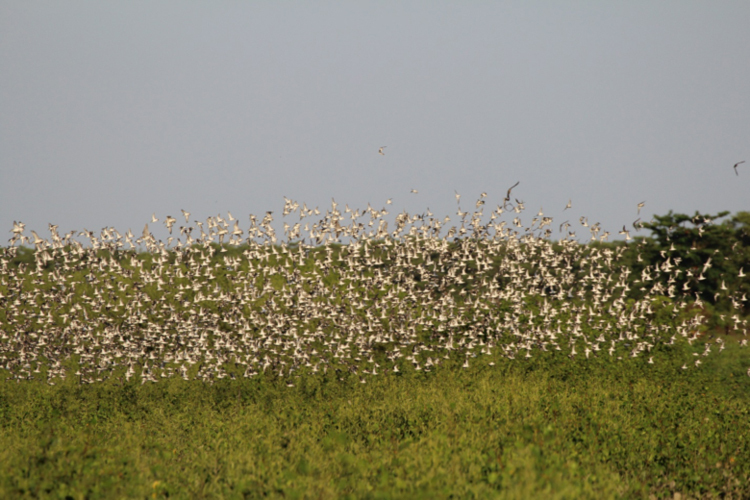 Foraging and roosting areas are available along the coastline on the mudflats and beaches in and near the Reserve, and the rice fields provide a mix of seasonally flooded areas and drier upland habitats. A major question is, how will this place be managed in the future? To help answer this question and to help conserve this very important piece of the Atlantic Flyway, GEPOG and the Conservatoire du Littoral are working to purchase this important area and develop a management plan to benefit foraging and roosting shorebirds and other waterbirds. During a field visit to the area, Monica was able to provide advice regarding a variety of different management options, while Rob led discussions regarding how these important local efforts fit within broader shorebird conservation initiatives, such as the Atlantic Flyway Shorebird Initiative, and the Arctic Migratory Bird Initiative. 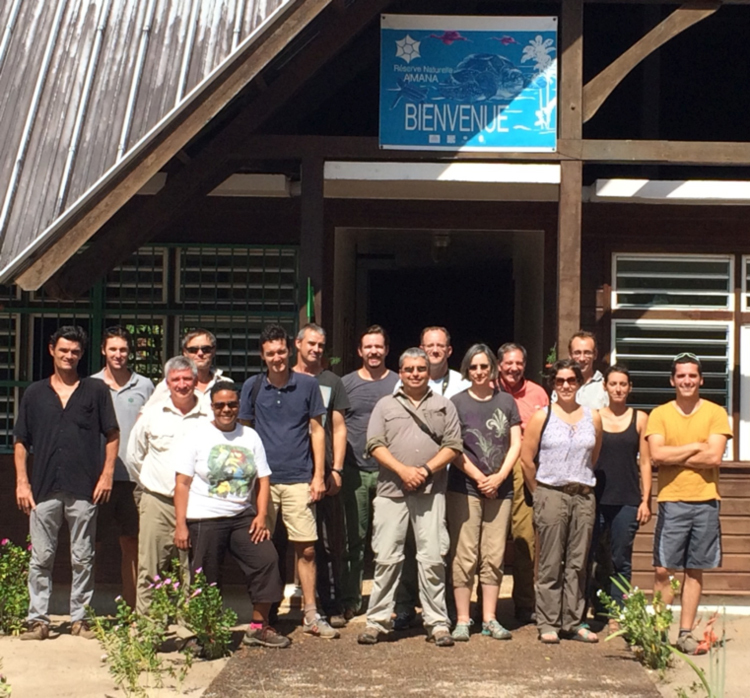 We are grateful to the workshop hosts and local leaders for the invitation and warm welcome to French Guiana including Nyls de Pracontal, Vincent Pelletier, and Stanley Pinas with GEPOG, Johan Chevalier with Réserve Naturelle de l’Amana, and Elodie Raye with Conservatoire du Littoral. We are thankful for their graciousness in hosting the meeting almost entirely in English. We left inspired by the commitments to conservation efforts in such an important region for migratory shorebirds. Anthony, E.J. A. Gardel, N. Gratiot, C. Proisy, M.A. Allison, F. Dolique, F. Fromard. 2010. The Amazon-influenced muddy coast of South America: A review of mud-bank-shoreline interactions. Earth-Science Reviews, vol 103. Standing on the sand dune between the now-flooded rice fields and the Atlantic Ocean, forum participants survey the area. 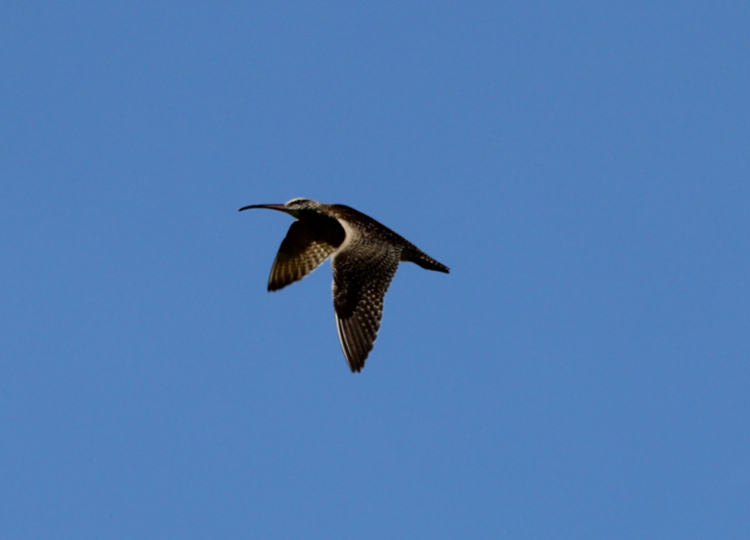 A Whimbrel flies overhead on its way from the young mangroves and mudflat to a roosting area in an abandoned section of rice fields. A large flock of Semipalmated Sandpipers assemble in Kourou, French Guiana.